More Than A Bond of Blood is a big anthemic start to the album, with big hooks and solid riffs, the vocals are pounding and crunching. Colors of My Life moves from shifting tonalities to outright thrash masterpiece, a song that has many variations and is sure to attract live audiences everywhere. Refined By Fire is complex, a work of art, moving from dark and foreboding to light and hopeful and back again, whilst the guitars sing out their melodies and continue taking things beyond the extreme. Scarred is a mix of harmony and darkness, with the guitars and vocals adding harshness and brutality. Young Blood is brutal, moving and shaking through the elements, and carrying a darkness with it that would ensure that there are moshpits a aplenty when played live. Brotherhood of Bastards is snake like, moving and grooving through the elements and carrying extra weight through various interludes and instrumentation. Bones Of The Elders is epic in size and scope, carrying weight, tradition and power through every fibre of its being. 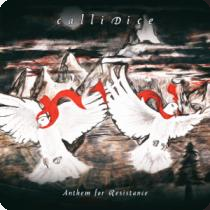 Anthem Of Resistance is epic, soaring vocals, punching guitars and destructive rhythms a true anthem. The album is out now via Inverse Records.